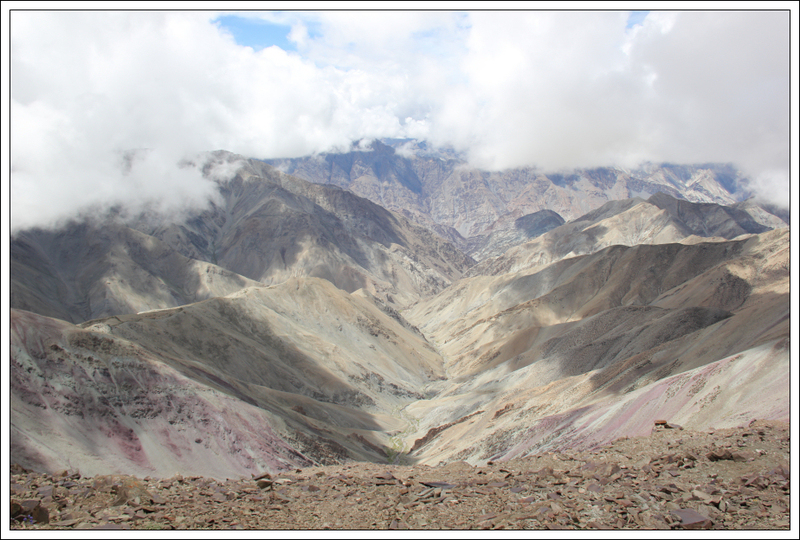 On 15th August, we left Leh to drive to the start of our trek. 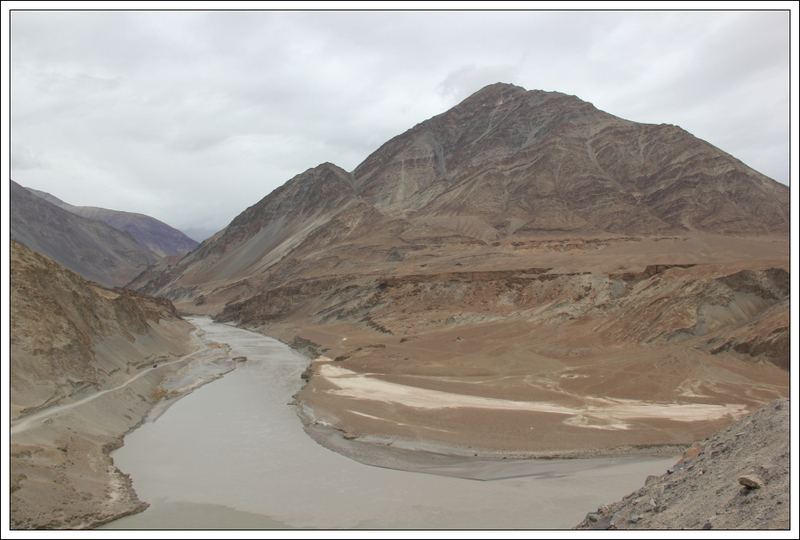 The start of our trek was along a dirt road a few kilometres from the confluence of the Indus and Zanskar rivers. 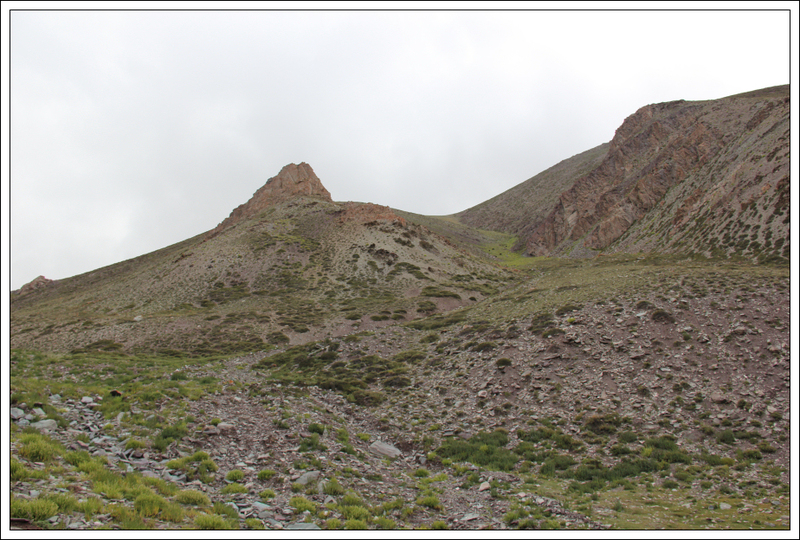 The starting height of our trek was just below 3200m i.e. 300m lower than Leh. 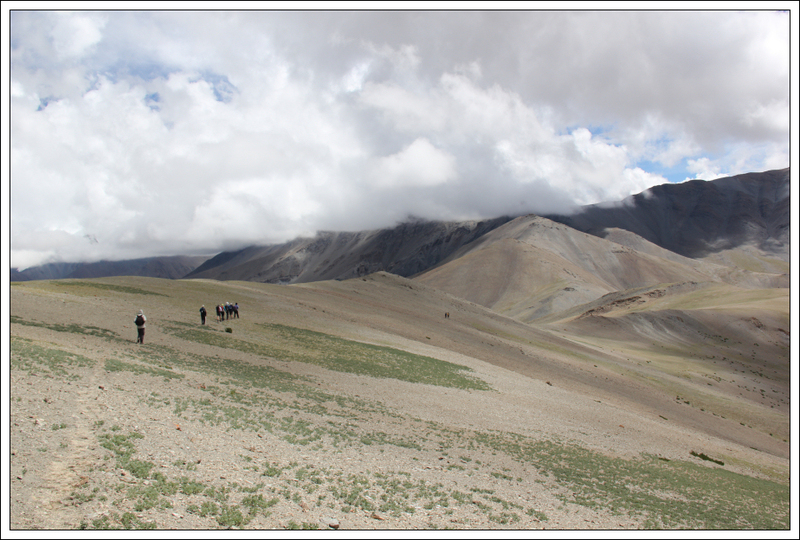 The first day’s trekking was far too easy; a walk of only 45 minutes duration with a height gain of only 50m. 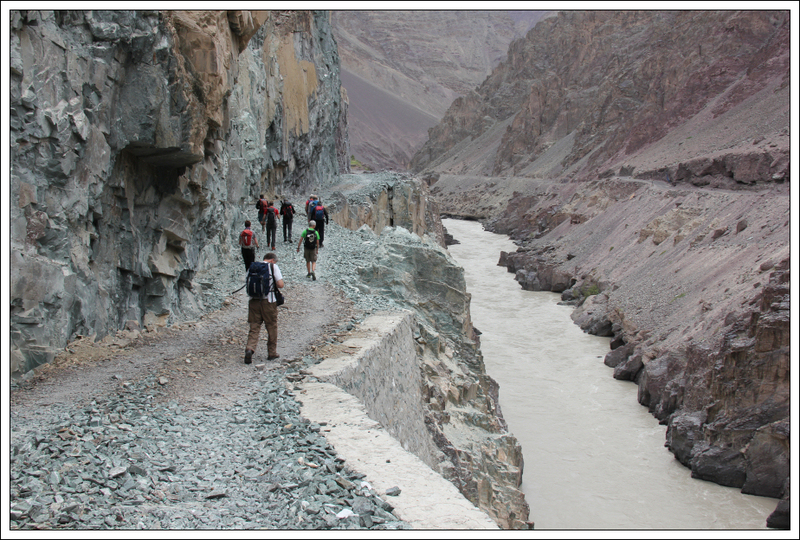 This short, easy walk took us to the small village of Choksi. 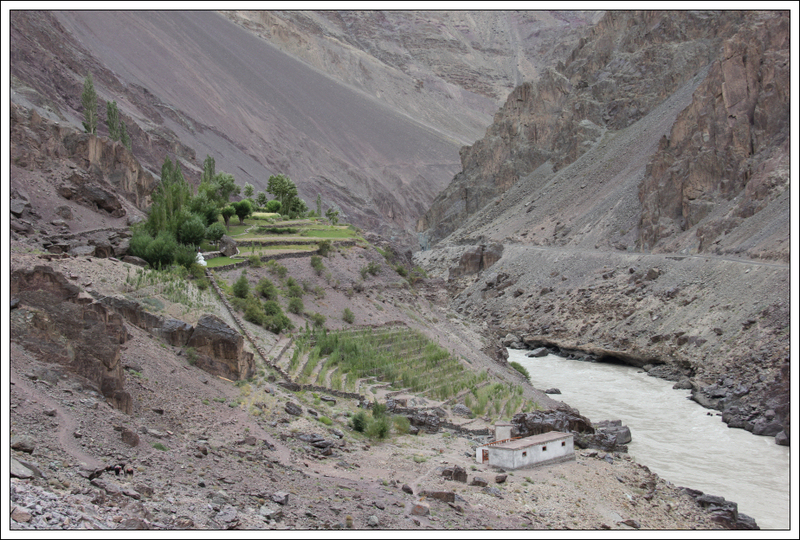 Choksi is a self-sufficient village inhabited by one extended family who farm the small valley. 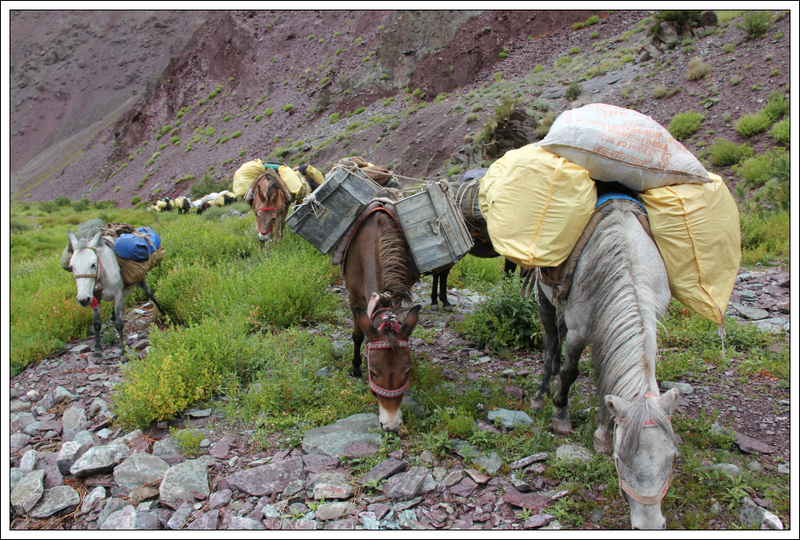 During the short walk to Choksi we met a few of the mules that would be carrying the camping equipment and provisions throughout our trek. 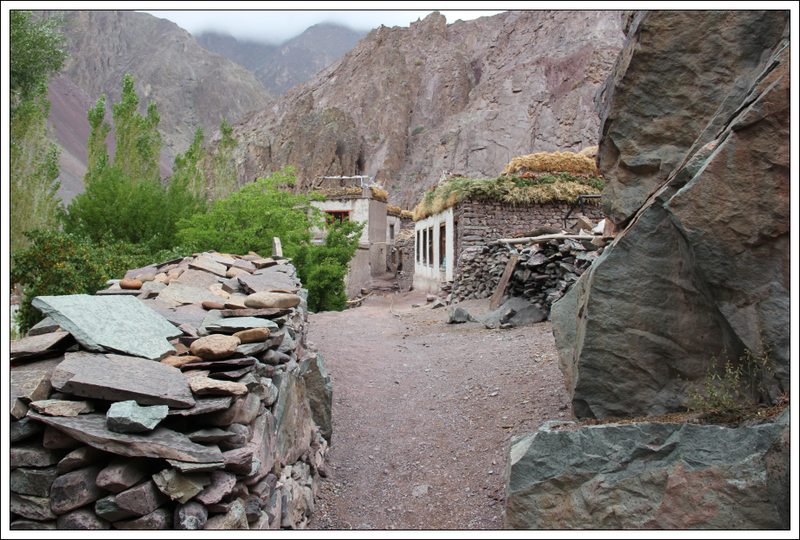 The village of Choksi was quite nice with friendly inhabitants. 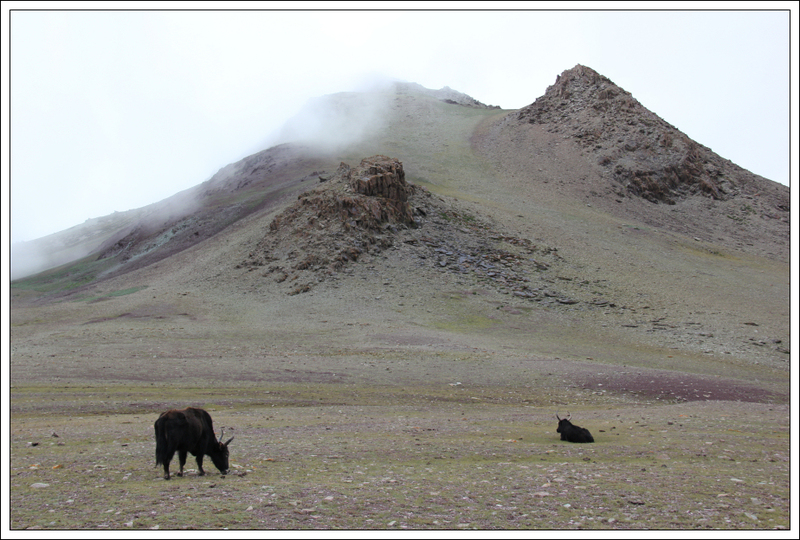 In the village we saw our first “Jo”, a cross between a cow and a yak. We also saw a dog that looked like a Corgi! 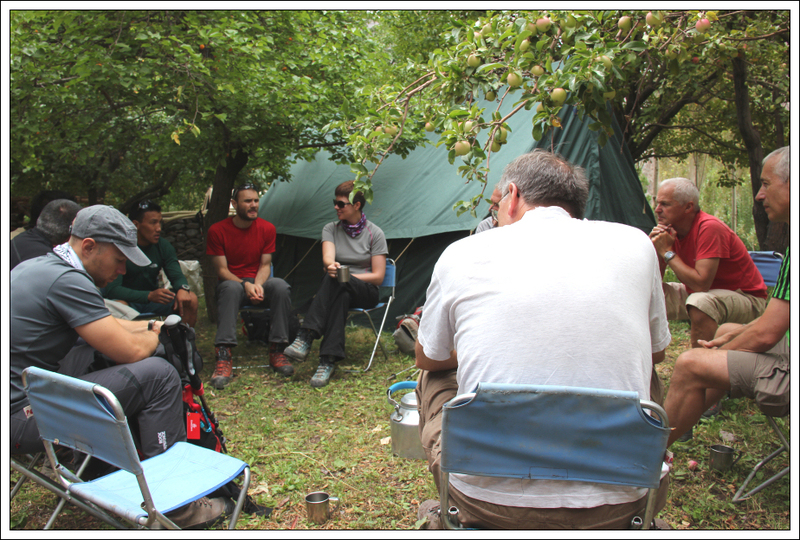 At lunchtime we sat outside having a cup of black tea. 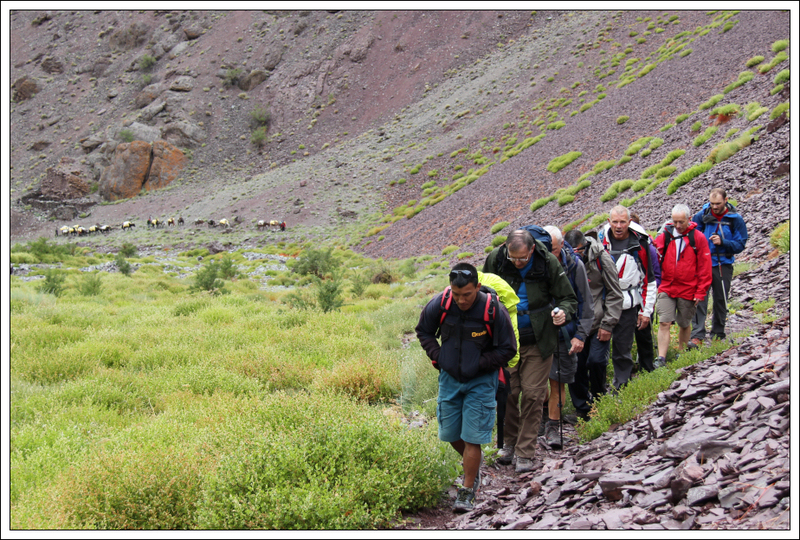 After lunch we undertook a two hour walk, ascending 300m up a gorge to a height of circa 3550m before returning to our camp at 3250m. 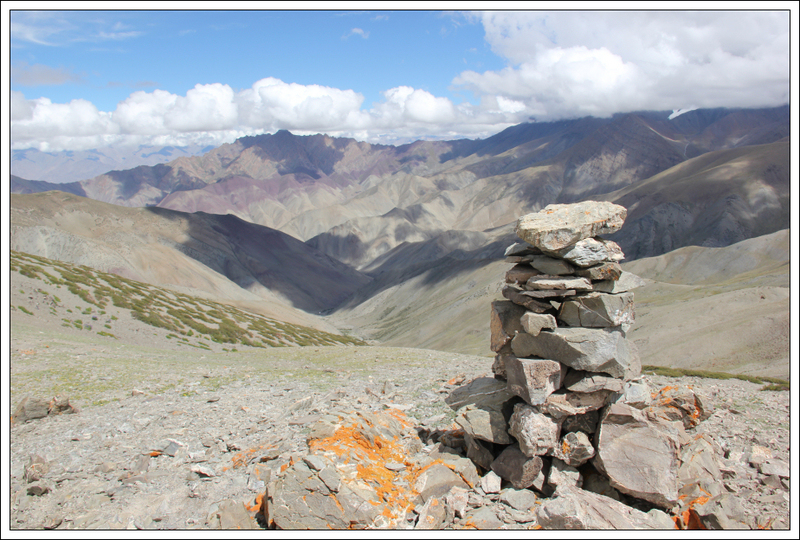 It is good practice to ascend high and sleep low to help with acclimatisation. 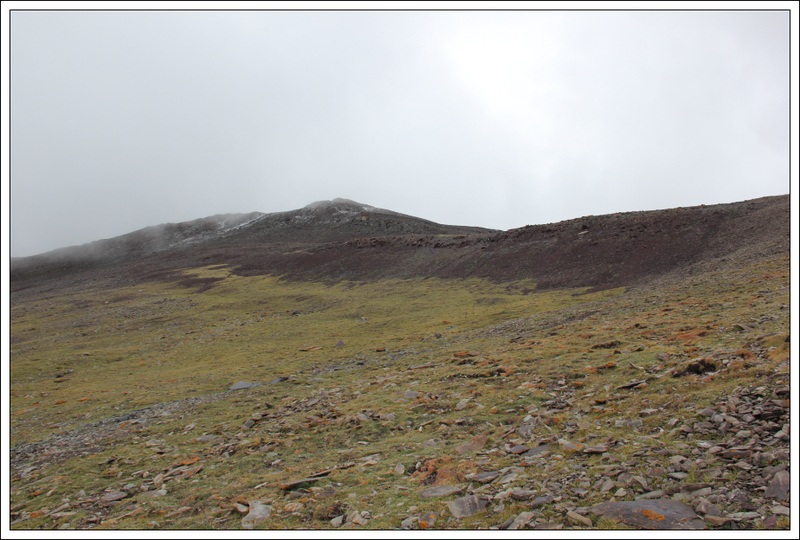 The weather during our first few days trekking was a bit pants. 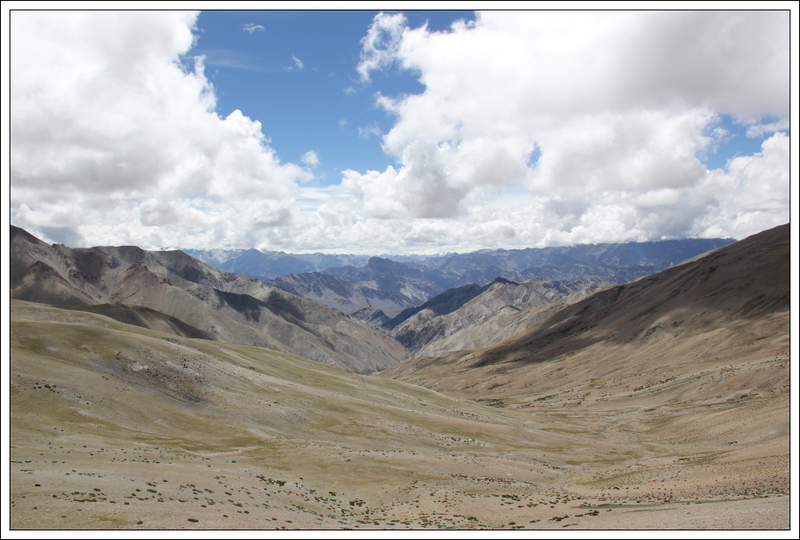 Ladakh is normally a mountain desert with little/no rain. 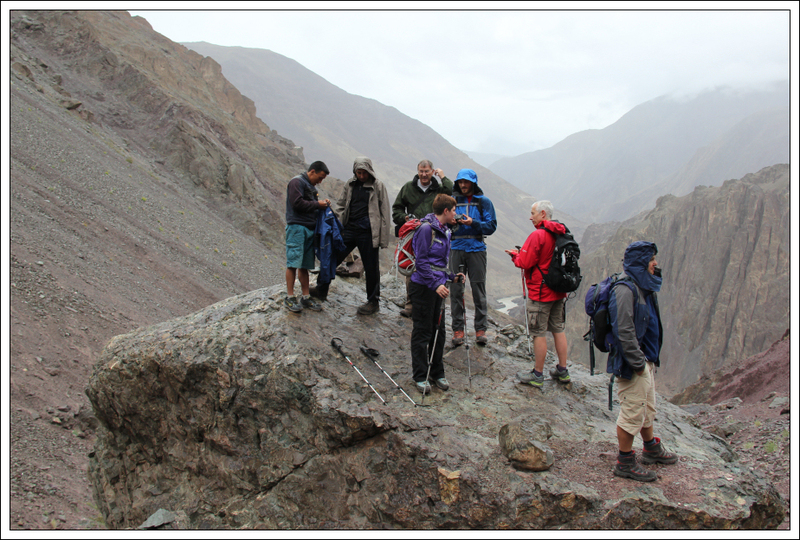 We endured a fair bit of rain during the trek . While the rain didn’t bother me that much, it was not ideal conditions for taking photographs. The light was not good. 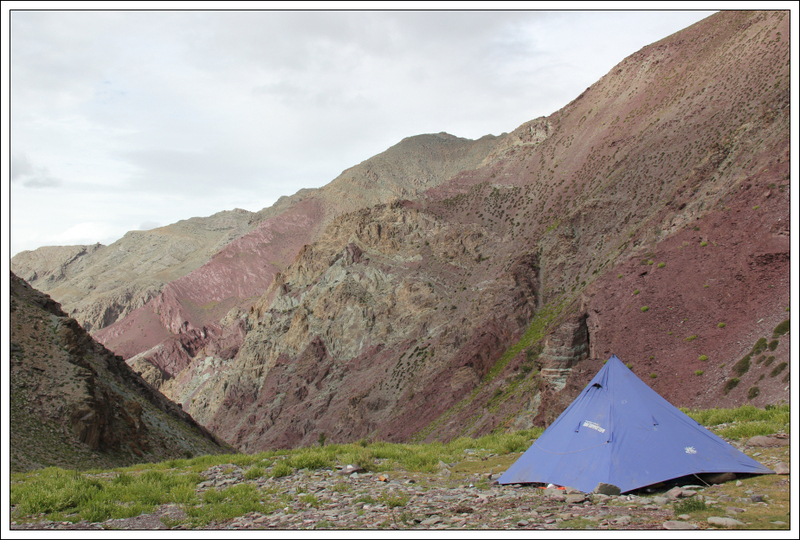 After descending 300m back to our first night’s camp at Choksi we had a good meal and then settled down for the night. 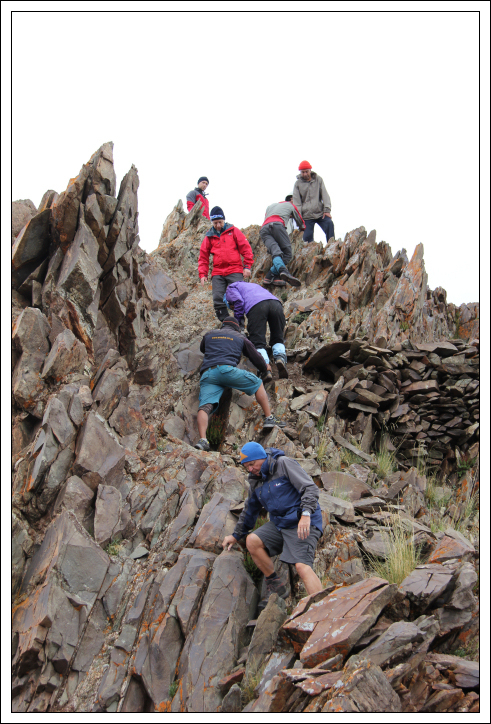 The next day we re-ascended the 300m reconnoitred the previous day before continuing on up the gorge. 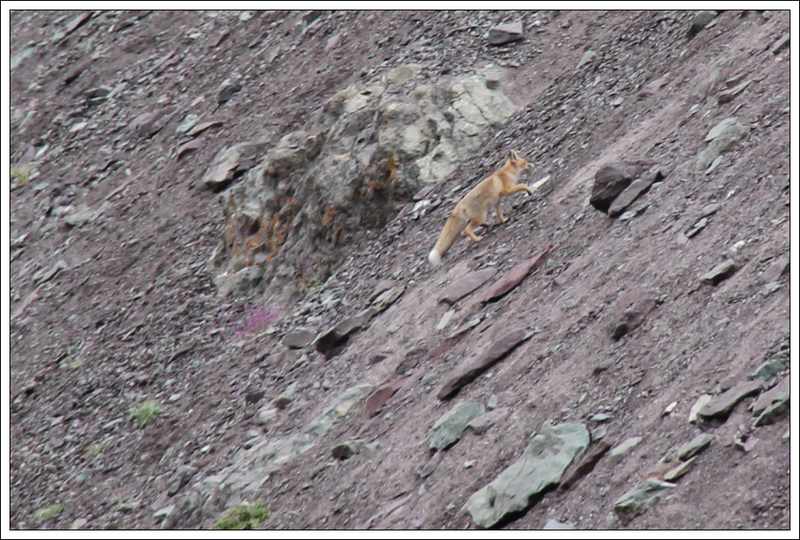 As we progressed up the gorge, we spotted a Himalayan Red Fox. 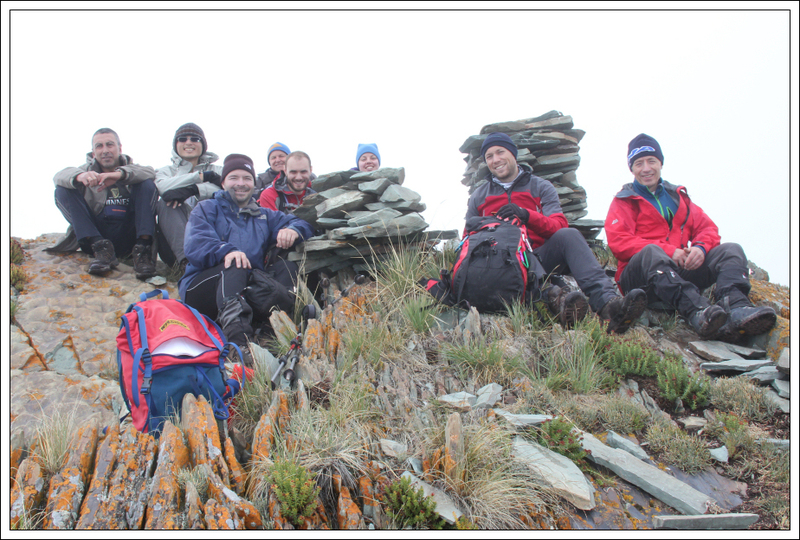 We stopped for a short break after circa one hour of walking. 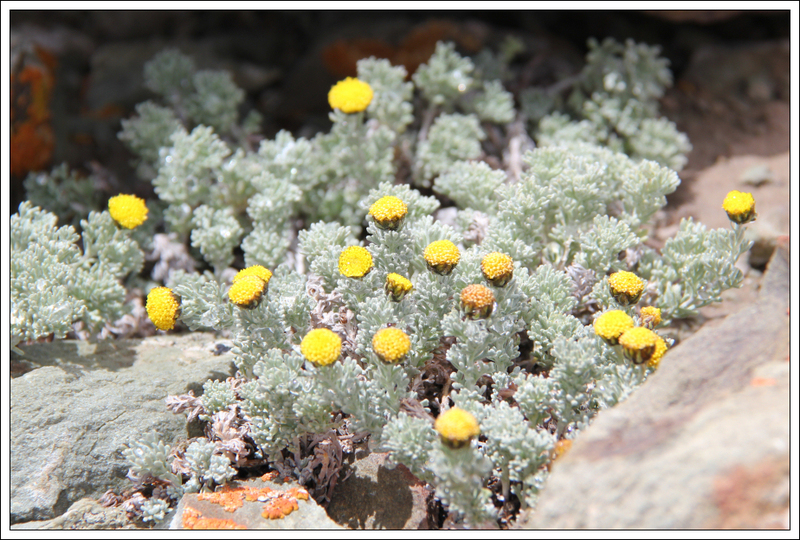 The rock colours are quite different from the rock back home. 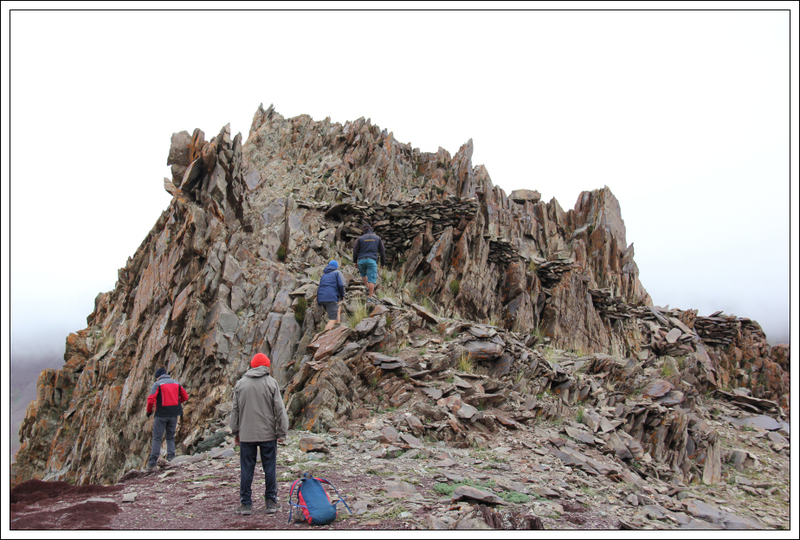 Much of the rock is metamorphic – slate and marble. 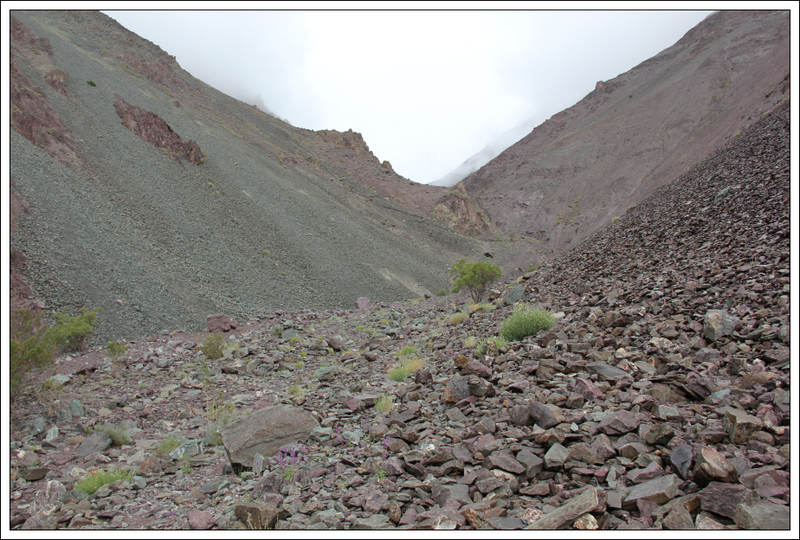 The purple colour seen in many of the following photos is slate, the green colour is marble. 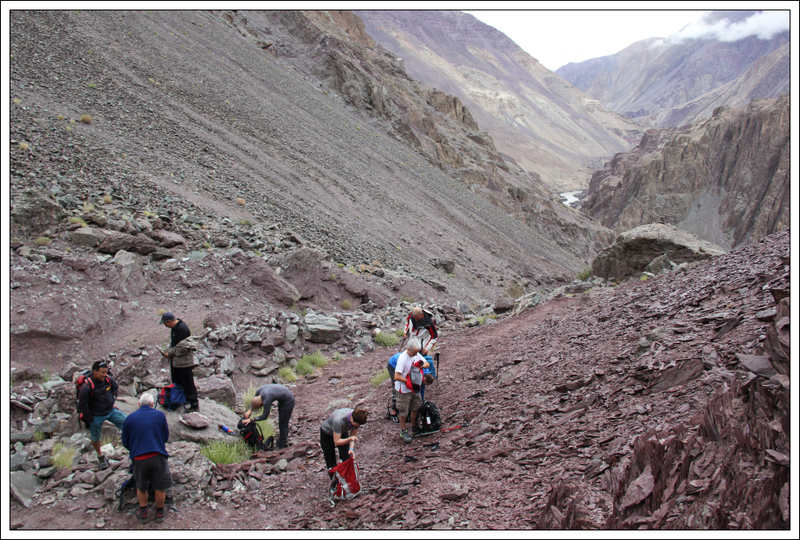 As we continued to gain height, the ascent become more gradual as the gorge widened. 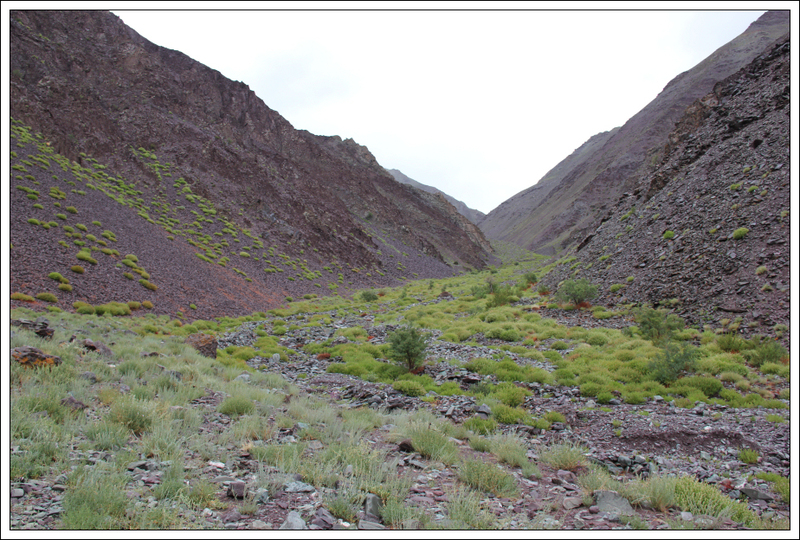 As we gained further height, we encountered more and more plants. 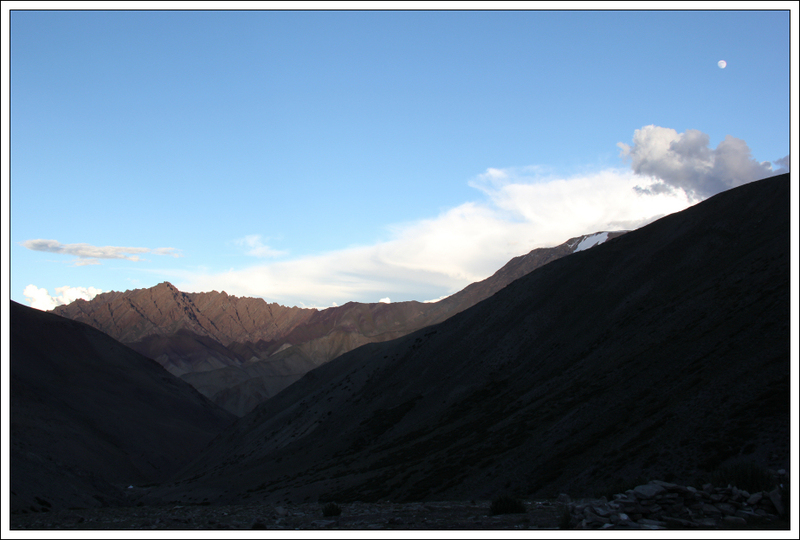 We eventually reached our second night’s camp at a height of 4300m having ascended 1050m from our first night’s camp. 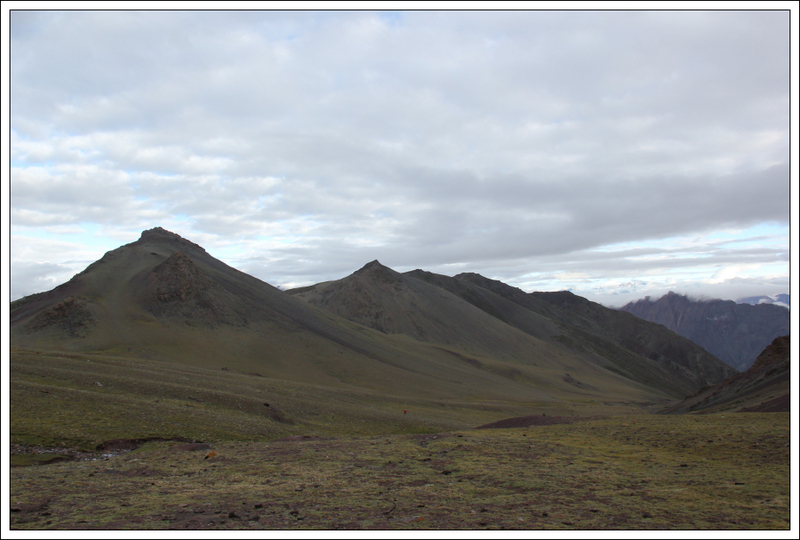 However, in order to further acclimatise we also ascended the rocky tor visible in the top right of the next photo before returning back to camp. 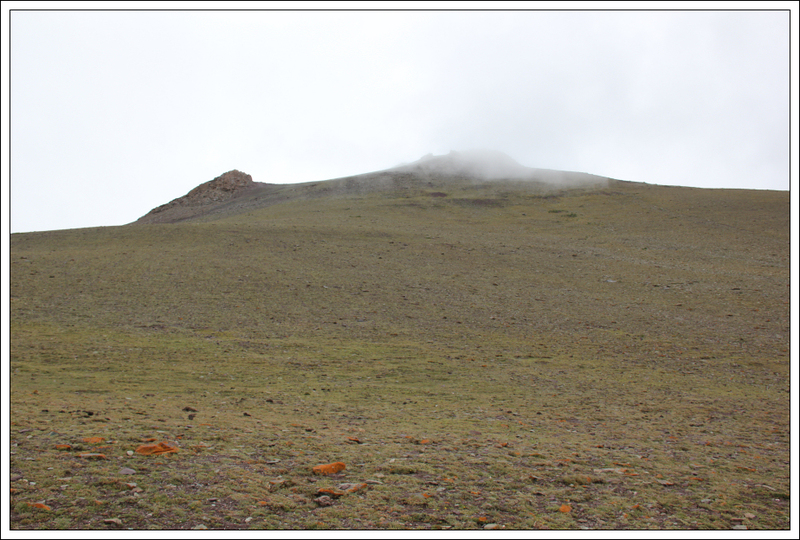 It was nice to ascend the rock tor (4520m) before returning to camp at 4300m. 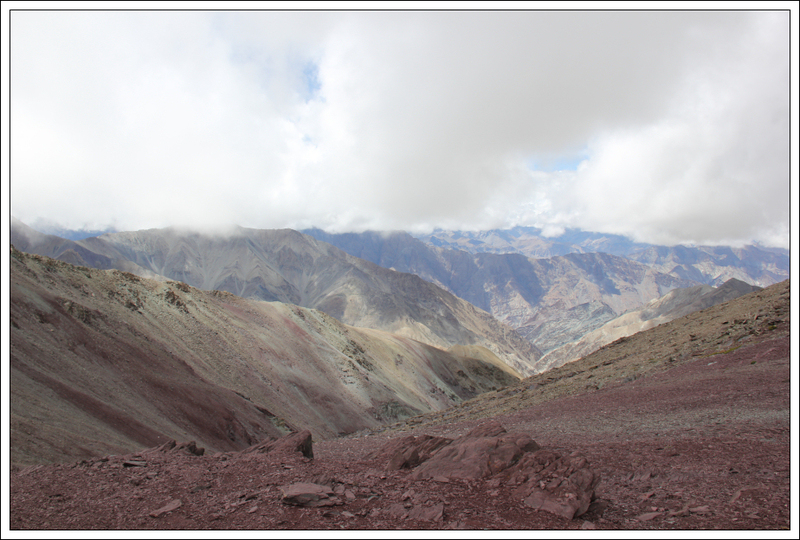 Despite ascending 1270m on day two I felt fairly good. 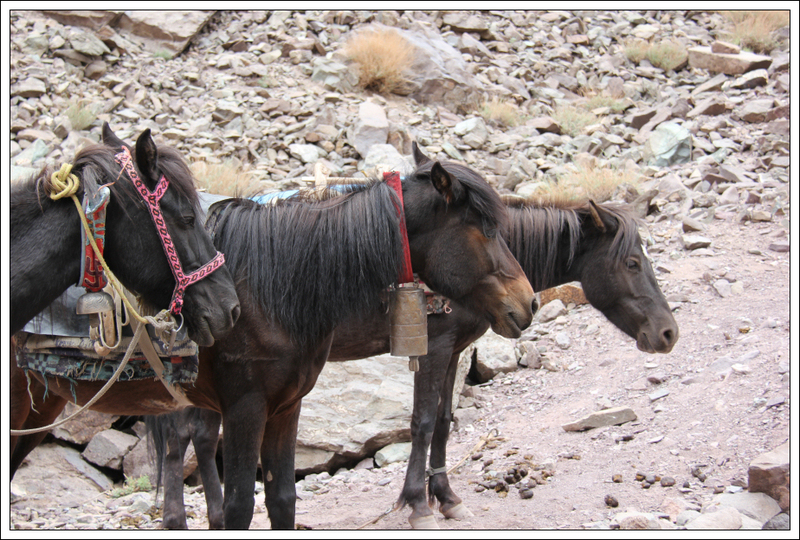 I found day three of our trek particularly hard. 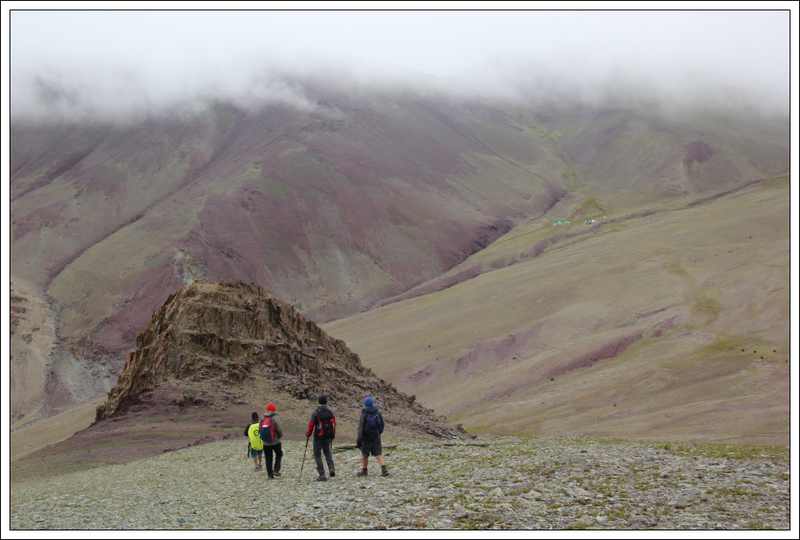 From a starting height of 4300m, we set off to ascend Exodus Peak (5056m). 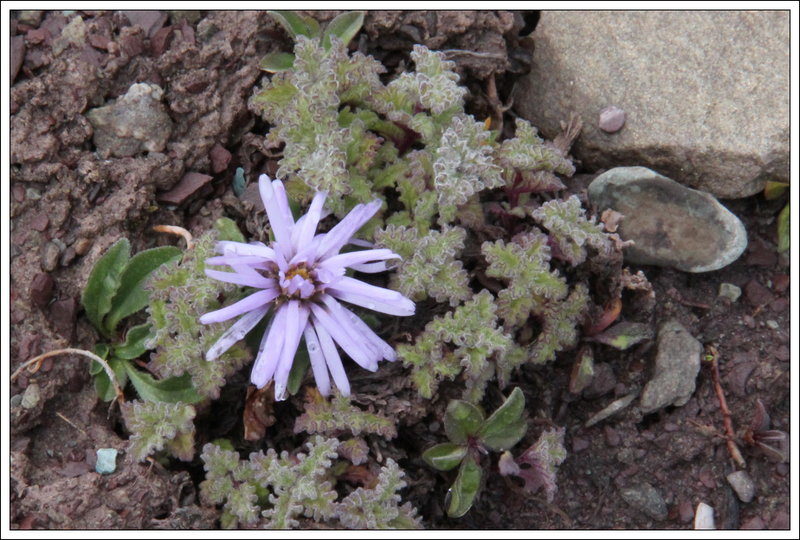 On day three, I started having intestinal issues which continued for a full week. I think it is inevitable to suffer with intestinal issues in India! 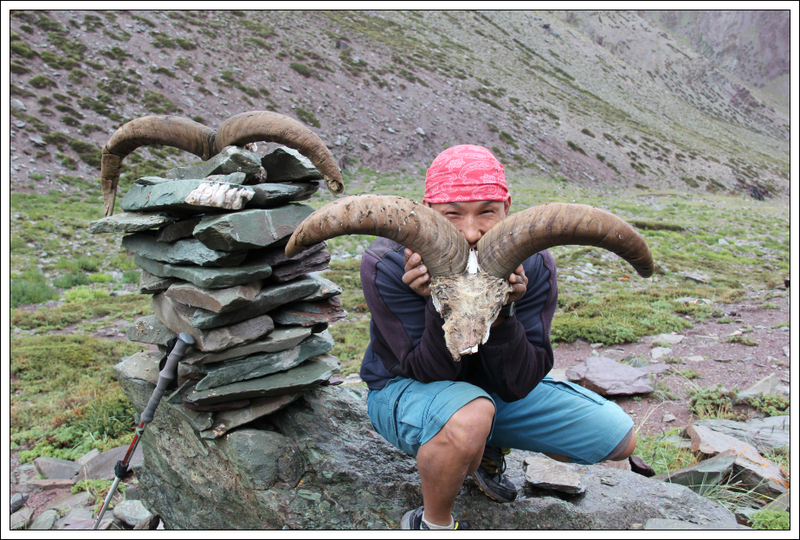 During the ascent towards Exodus Peak, we passed a cairn with the skulls of two Blue Sheep. 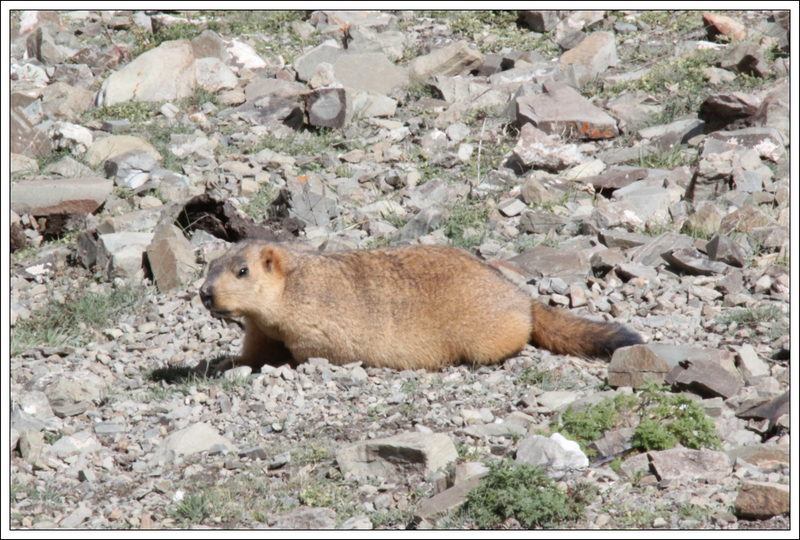 During the ascent we also saw our first sighting of a marmot. I didn't realise that a Marmot is a type of squirrel! 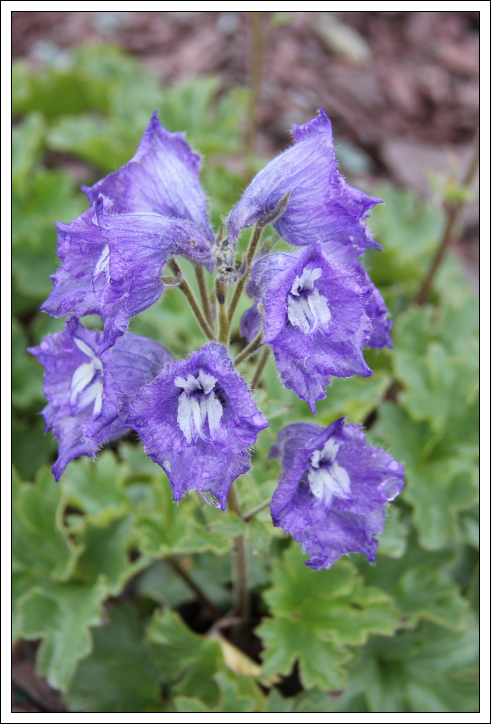 Between 4700m and 5000m, we encountered lots of nice wild flowers. 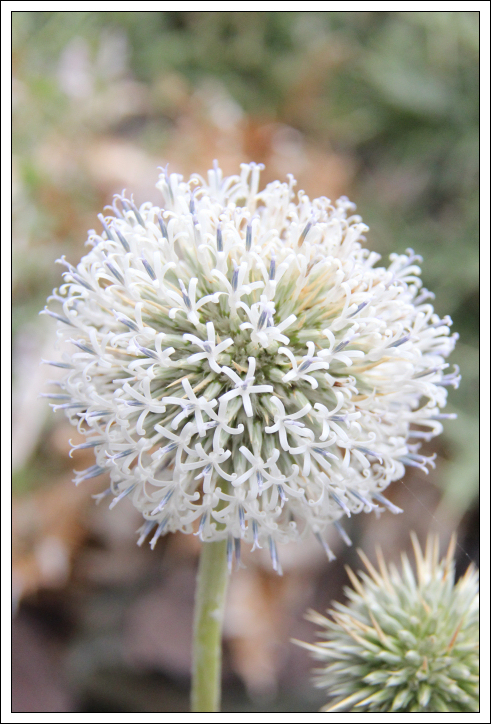 There were geraniums, wild rhubarb, thistles and many more unrecognisable ones. 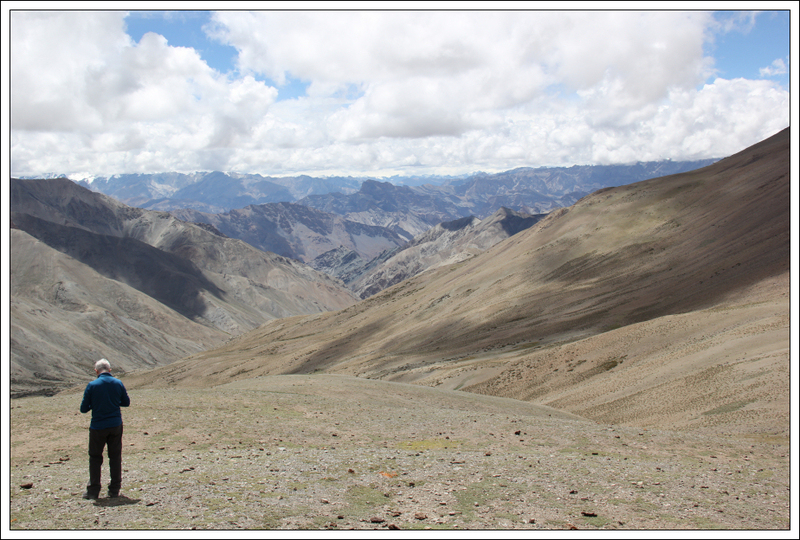 While it was nice to cross the 5000m barrier for the first time, I was definitely feeling the lack of oxygen. 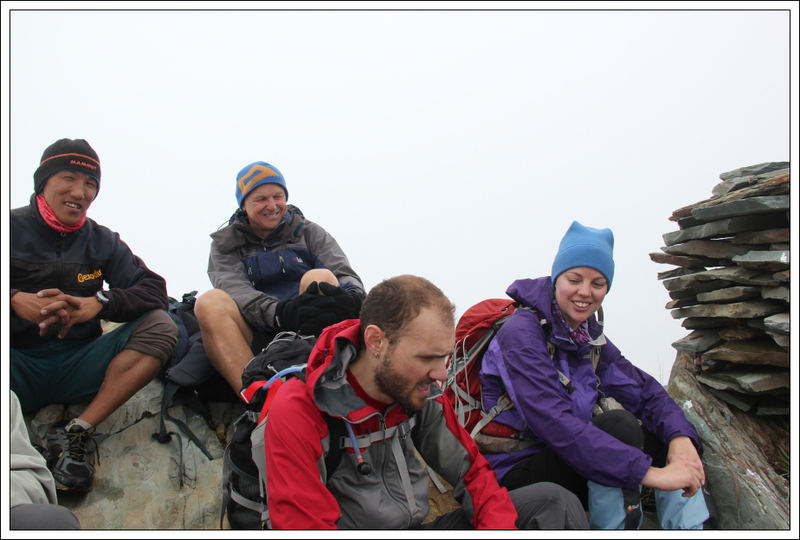 However, eight out of ten of our group made it to the summit of Exodus Peak. 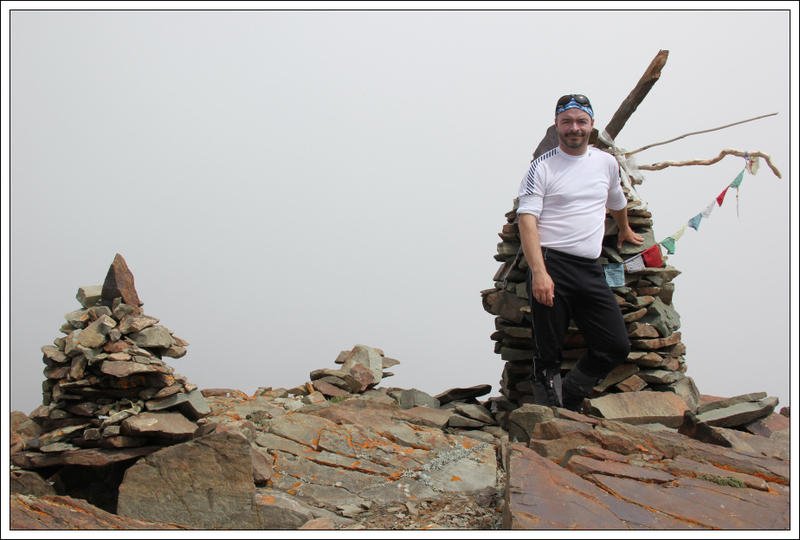 We were now higher than Mont Blanc . 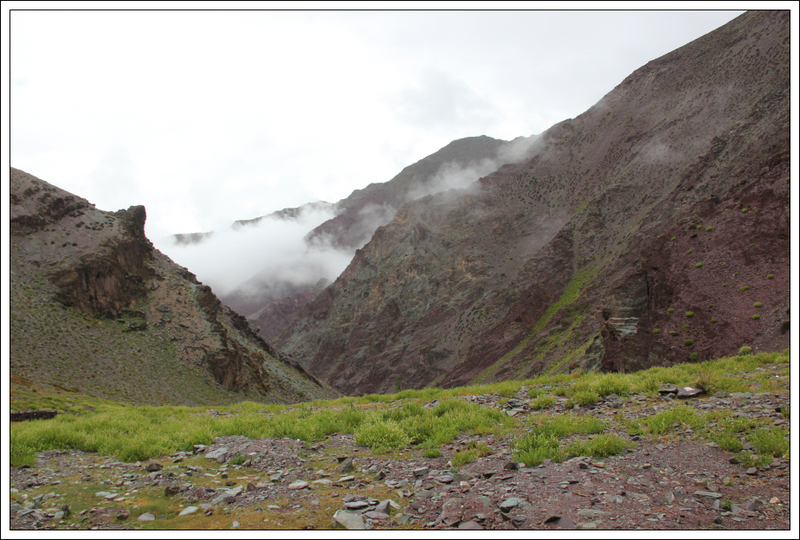 It was however disappointing that we were surrounded by cloud as Exodus Peak is supposed to be a great viewpoint in good weather. 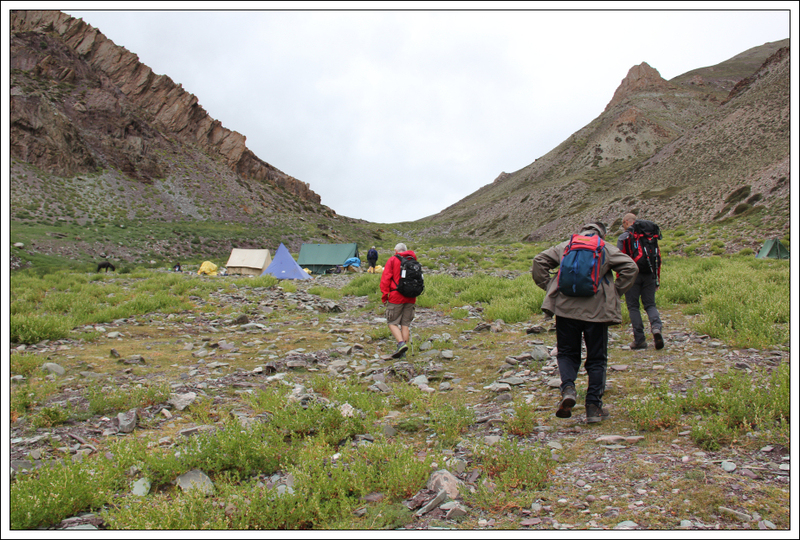 It was nice to look down on our third night’s camp during the descent of Exodus Peak. 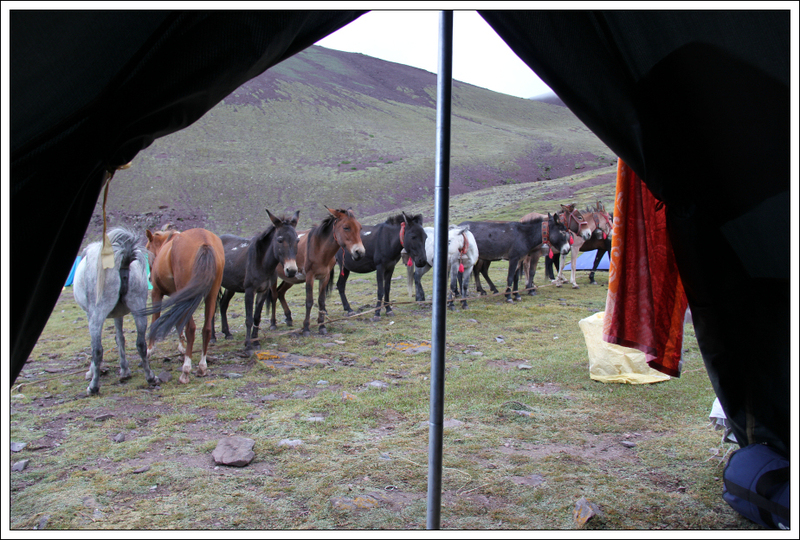 Our third night’s camp was at circa 4850m. 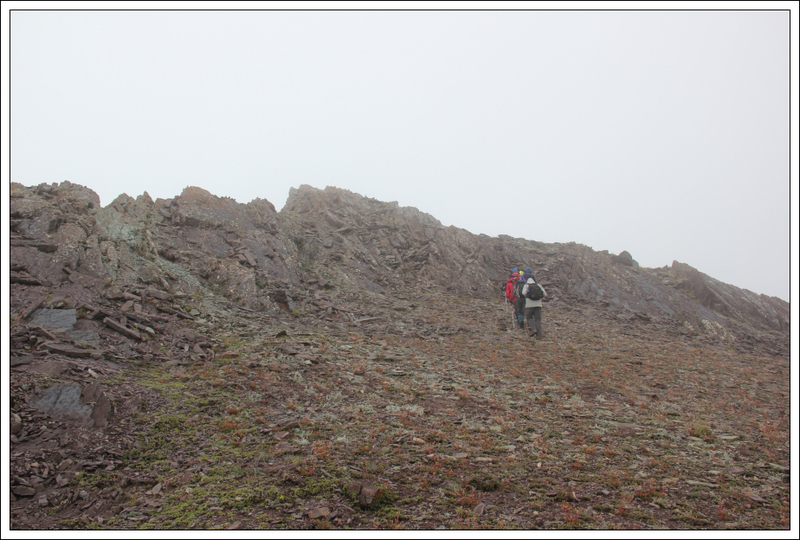 During the descent, we decided to scramble up the rocky tor on Exodus Peak. 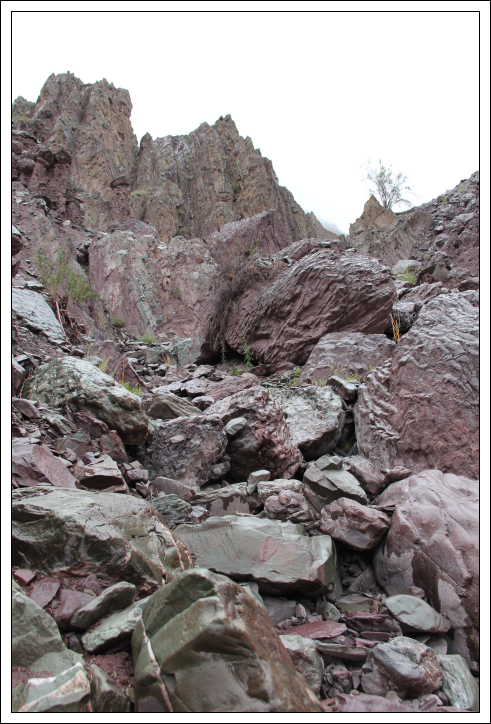 I was one of the first to scramble up and come back down in order to take some photos. 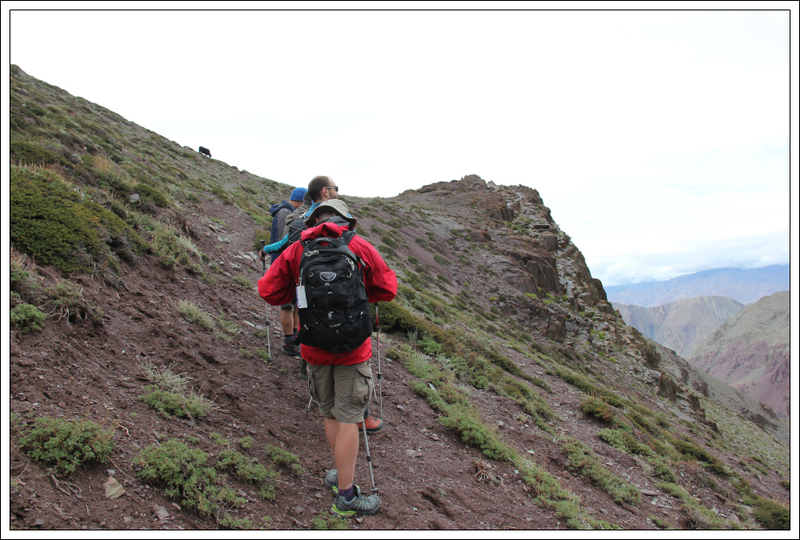 During the descent towards Camp #3, we passed a number of Jos. 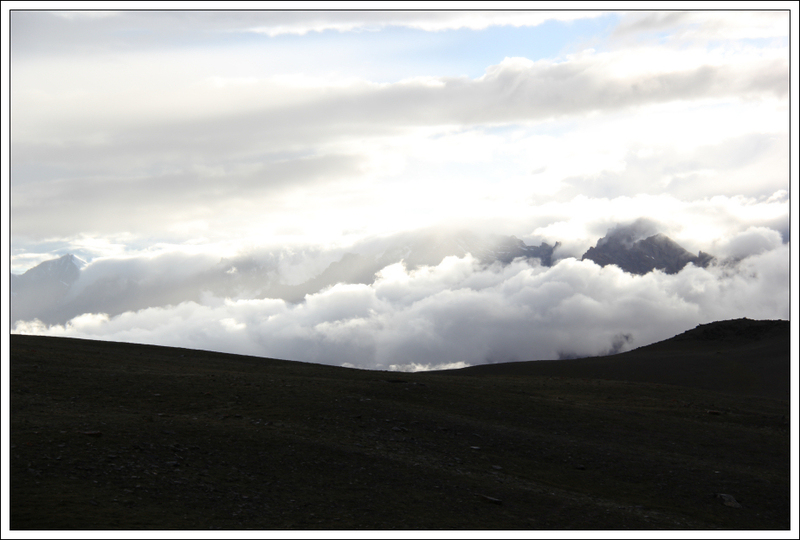 After returning to camp, the weather started to improve such that we caught the odd fleeting view across to the Zanskar range. 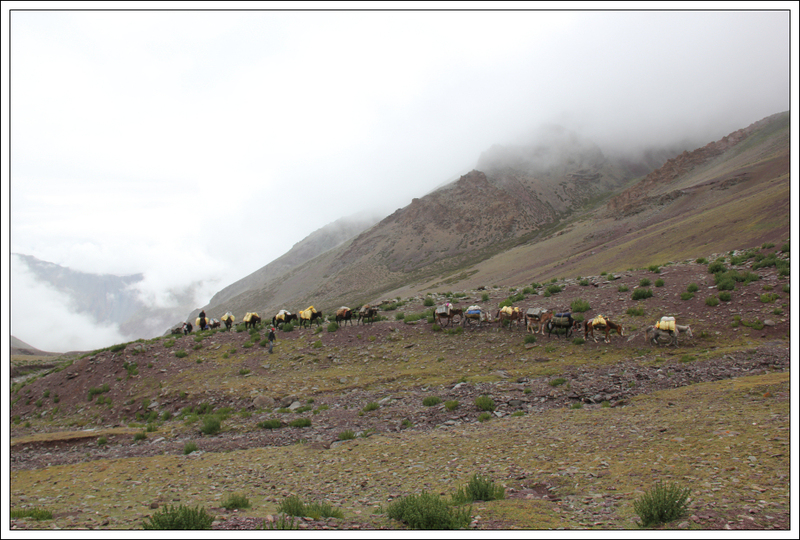 Our fourth day trekking was scheduled to be a “hard day” and it was. 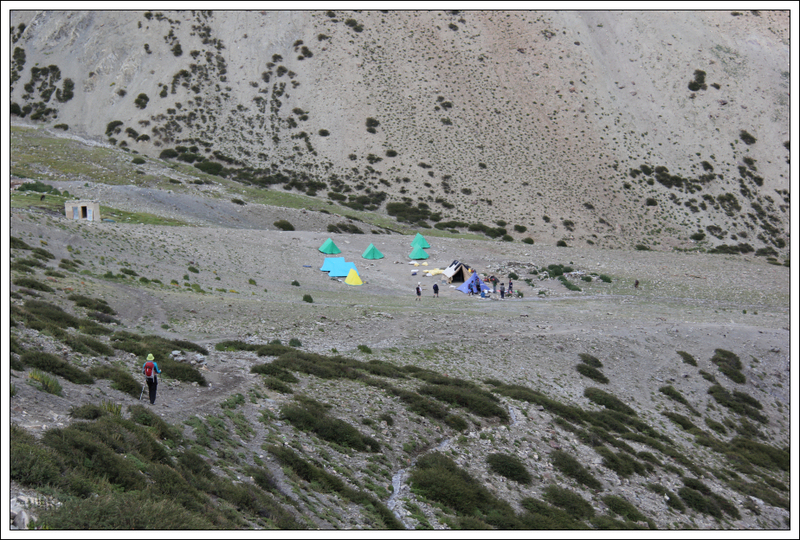 From our camp at 4850m, we set out to ascend Palam Peak (5380m). 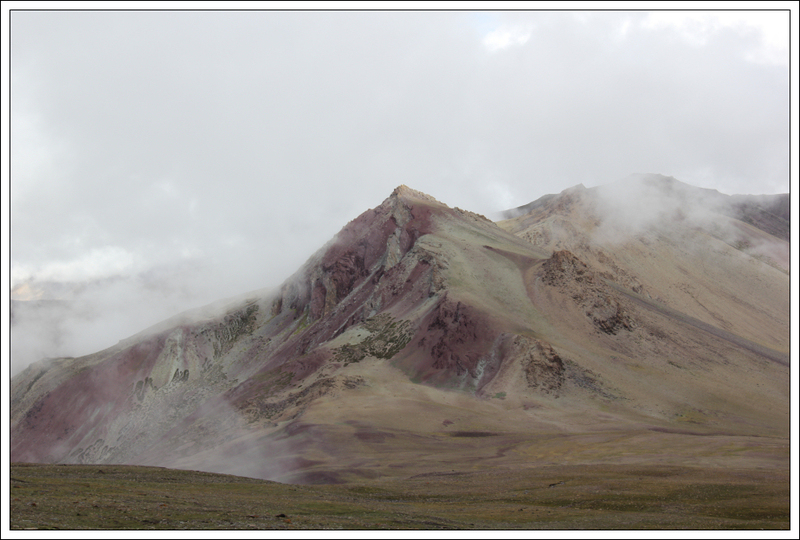 I particularly liked looking back to the colours of Exodus Peak. We were now facing our fourth consecutive day of mixed/inclement weather. 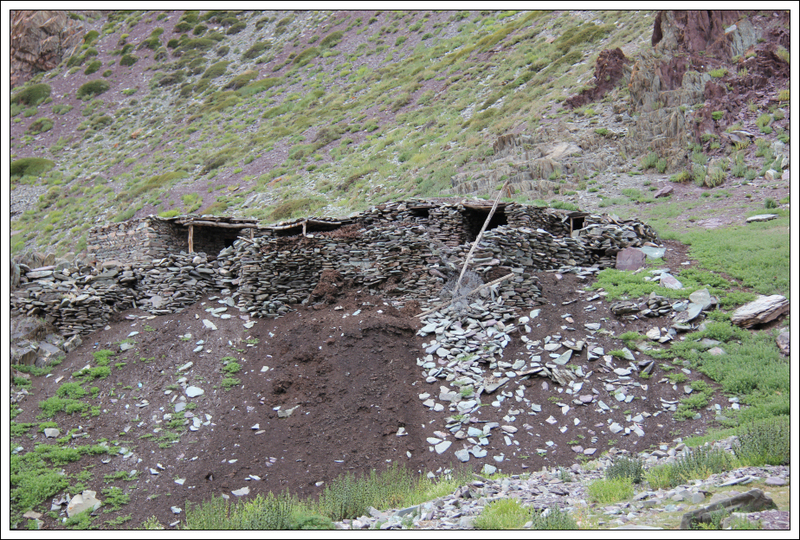 Hopefully things would improve for the latter part of our trek. 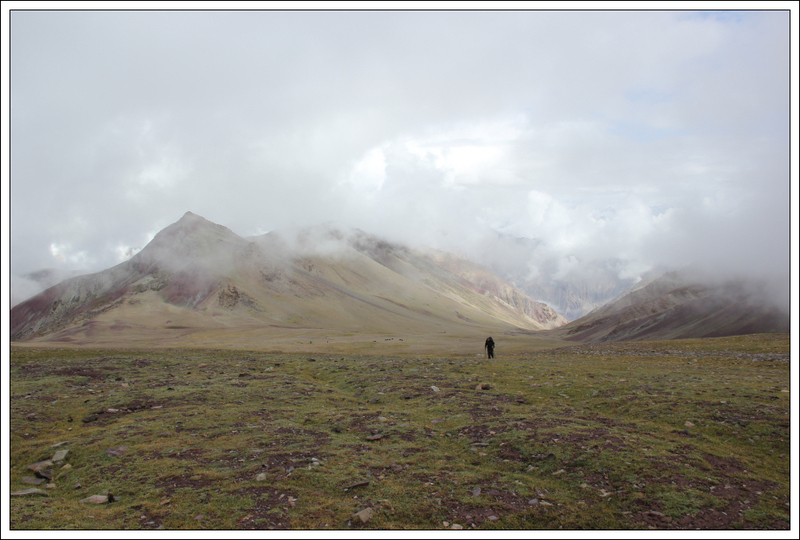 We made our way towards Kang La, the first pass of our trek. 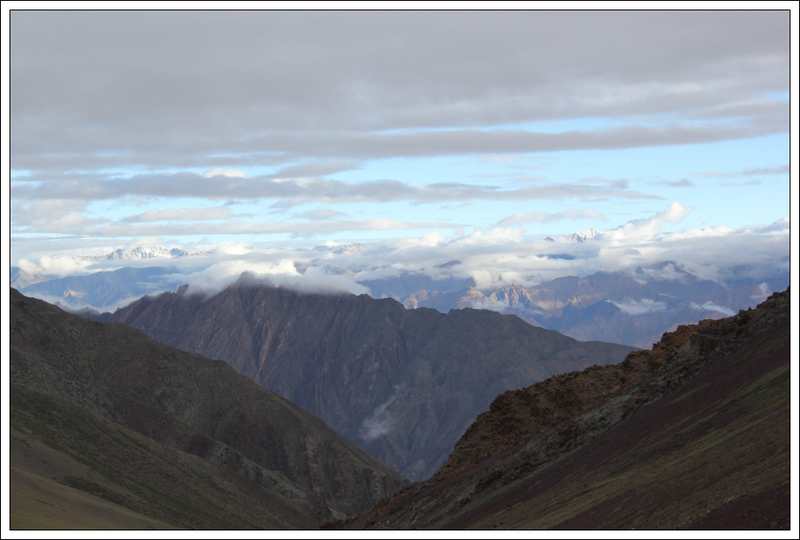 Kang La is at 5260m. 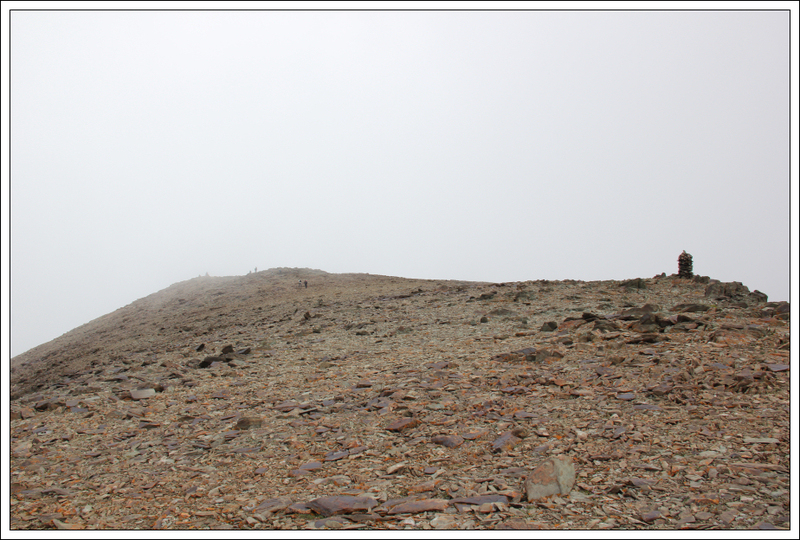 Before reaching Kang La, we took a small detour to ascend Palam Peak (5380m). 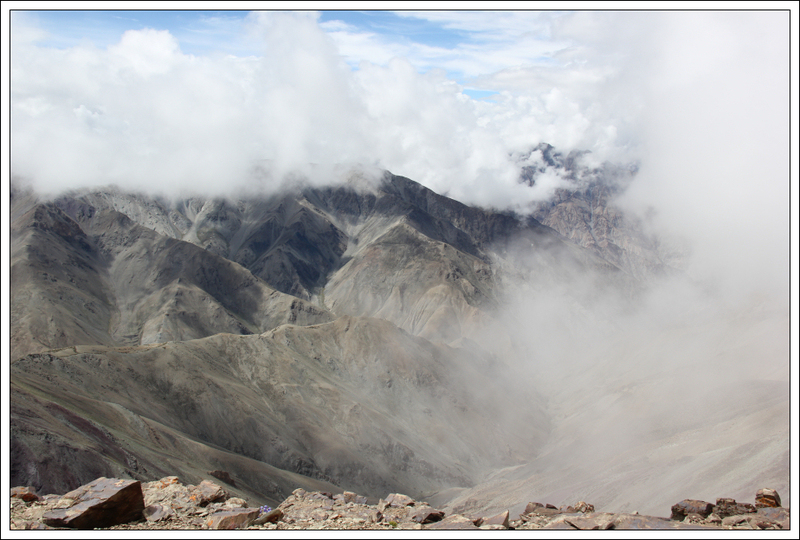 It felt great to reach the summit of a second 5000m peak. 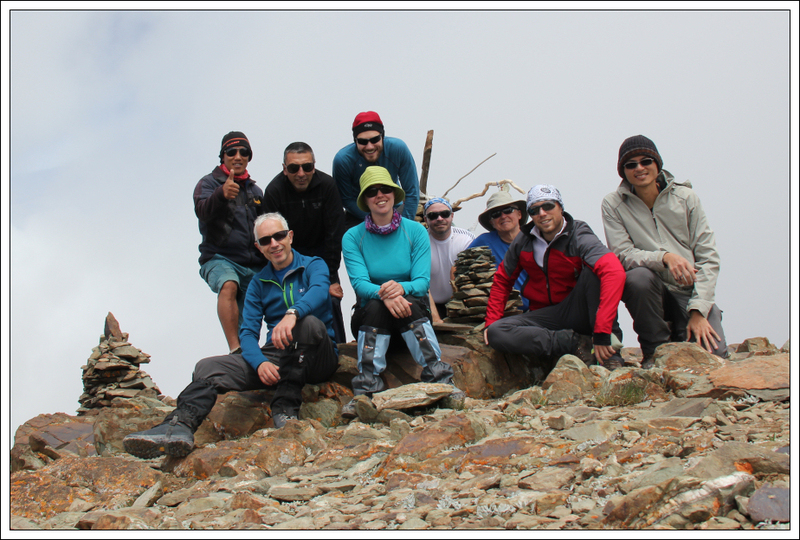 Again, eight of our group of ten made it to the summit. 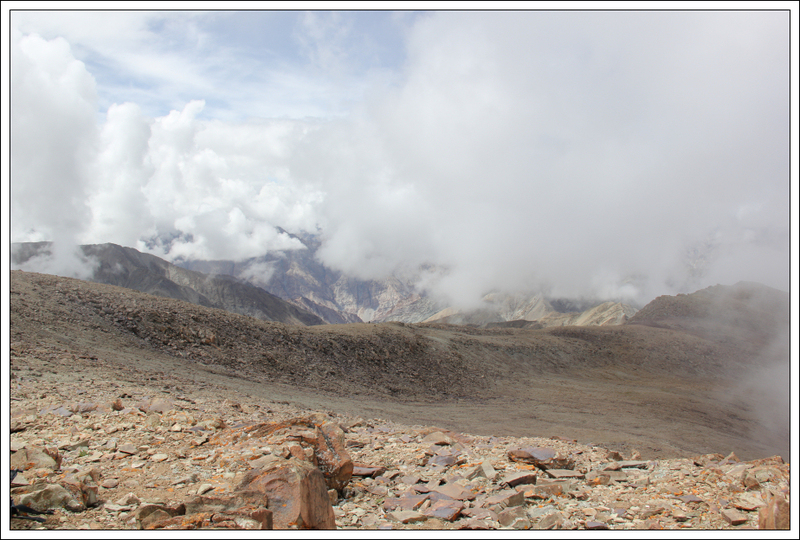 From the summit of Palam Peak, we made our way across to Kang La and then undertook a very long contour round into the next valley and then the next valley. 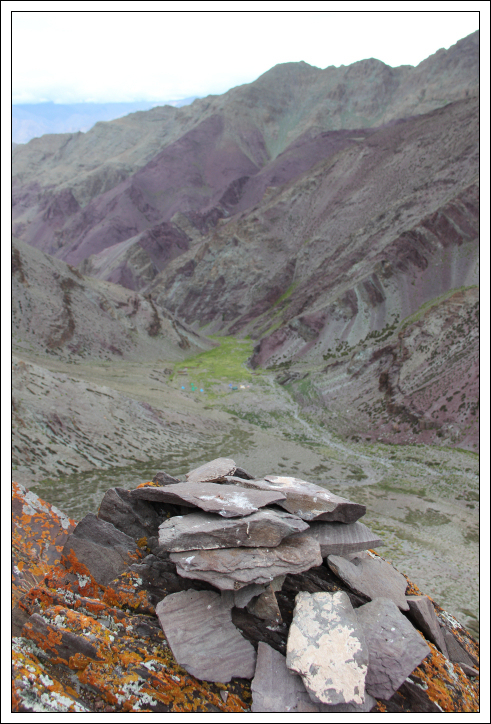 From Kang La, we made our way round to Ganda La (4970m). 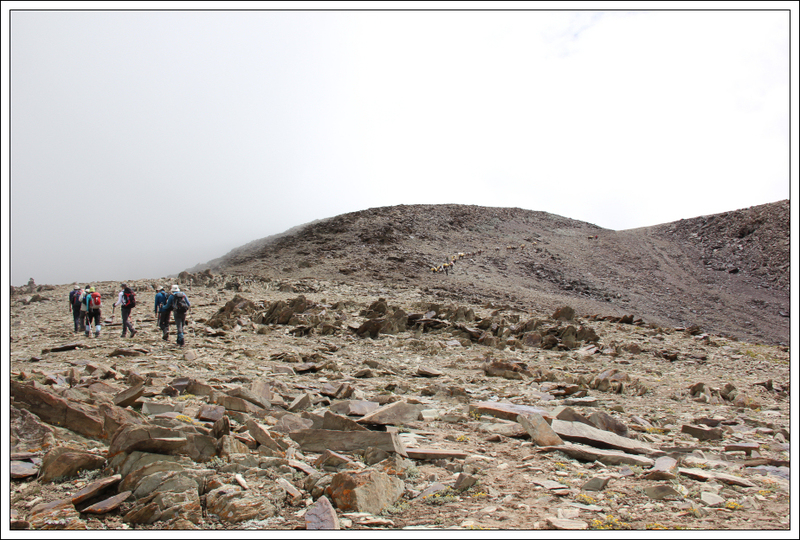 On reaching Ganda La, we started our descent towards Camp #4 at 4500m. 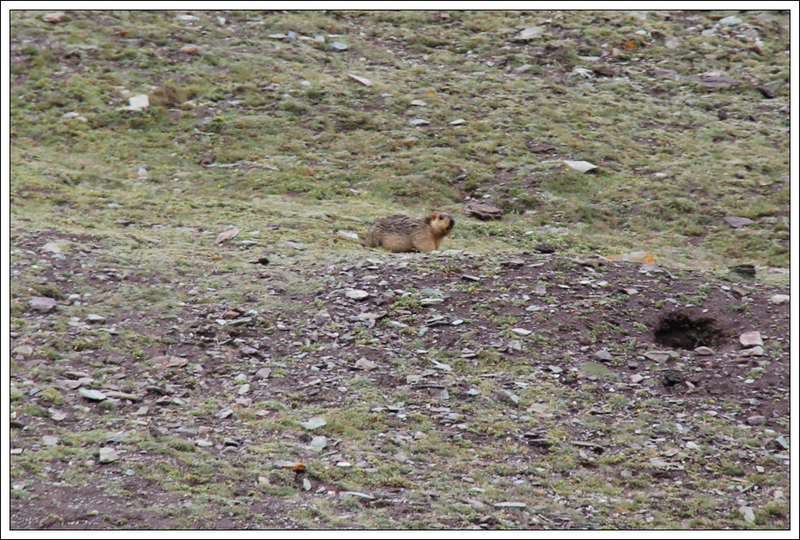 During the descent, we come across a number of marmots. 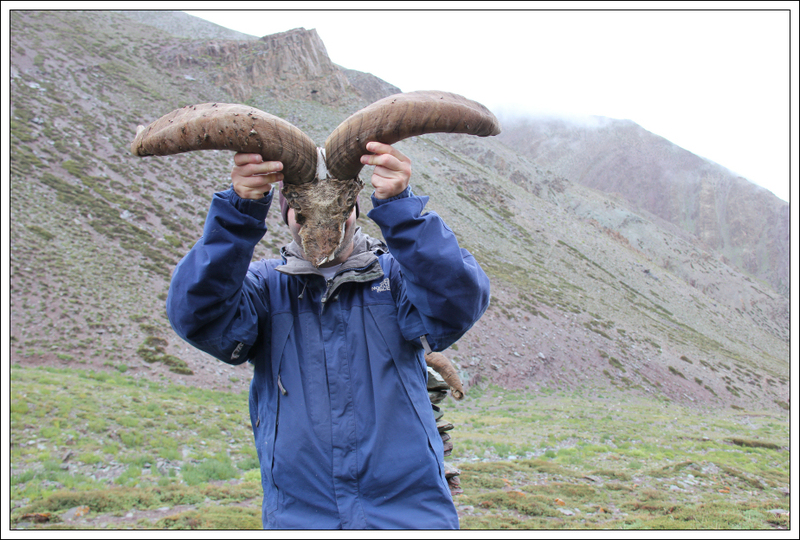 Next report to follow soon.